What makes a legend? A legend is someone who has impacted the lives of many. A legend is someone who uses his / her platform to inspire others. A legend is someone who has beat all odds and has persevered in every situation. A legend is someone who has made history. A legend is the one and only, Sugar Ray Leonard. We all know the iconic Sugar Ray Leonard as one of the most renowned and distinguished, professional boxers on this planet. He has made records, won many championships and a gold medal in the Olympics. Sugar Ray Leonard’s accomplishments are unrivaled and he has changed the sport of boxing in so many ways. As soon as he stepped into the ring, the magic begun. With his indescribable skills and talent, his speed, and his precision, every match that Sugar Ray Leonard was in was truly an unforgettable one. He has left us at the edge of our seats during all of his fights and he never failed to make us all oh, so incredibly proud to call him our boxing hero. Not only is Sugar Ray Leonard a stupendous boxer, but he proves that he can excel in absolutely everything that he works on. He wrote his very own autobiography titled The Big Fight: My Life In And Out Of The Ring, which allowed us all to step into the icon’s life a little more. He has also served as a television broadcaster, he has acted in many movies, and he even created his very own foundation, The Sugar Ray Leonard Foundation, which helps provide research and care for kids with type 1 and type 2 diabetes. Sugar Ray Leonard truly is a role model and a great inspiration to everyone. I, Alexisjoyvipaccess had an excellent time covering the Habitat for Humanity Greater Los Angeles Builders Ball and had the honor of interviewing the consummate boxer, Sugar Ray Leonard at the event. Sugar Ray Leonard talked exclusively with Alexisjoyvipaccess all about what it was like for him showing his support and being honored at the Habitat for Humanity event, what advice he would like to give out regarding how people can give back to others, and so much more only in our VIPAccessEXCLUSIVE interview. Sugar Ray Leonard even sent out a wonderful message to all of his fans – hear what he had to say in our VIPAccessEXCLUSIVE interview below. Thanks for the amazing interview, Sugar Ray Leonard! 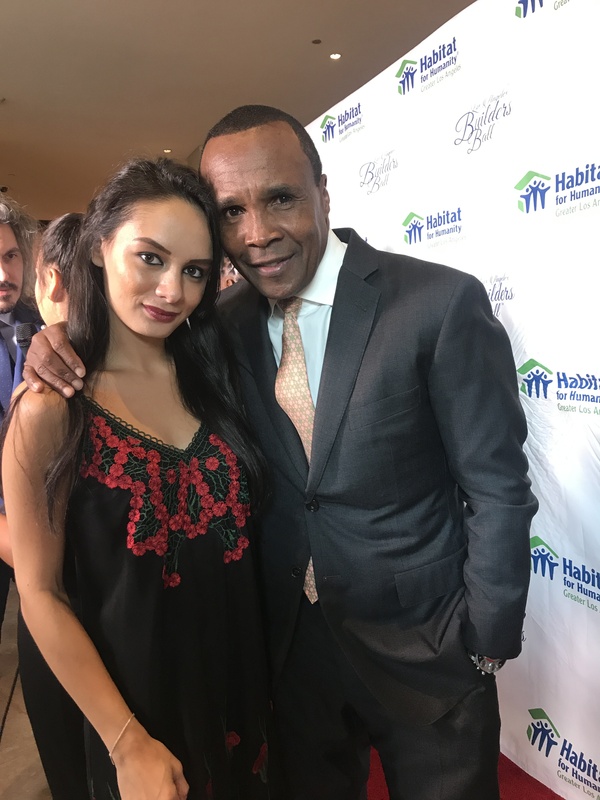 Check out my VIPAccessEXCLUSIVE interview with the remarkable Sugar Ray Leonard at the Habitat for Humanity Greater Los Angeles Builders Ball below! Previous VIPAccessEXCLUSIVE: The Immensely Talented Hair Stylist Larisa Love Talks About Joico’s New Color Butters In Her Interview With Alexisjoyvipaccess! Next VIPAccessEXCLUSIVE: “Vanderpump Rules” Star Tom Sandoval Interview With Alexisjoyvipaccess At “The Road To Yulin And Beyond” Documentary Premiere!